Milton made the berry picking cut yesterday, and he was oh so giddy about it! My sister and her boys did not join, which means Milton was in because the littlest boy does not quite see all of our goldendoodle's "charms," like sloppy kisses, protective barks, and clean-up licks. I am confident that the Milt will win him over by summer's end -- He tends to have a downright happy effect on most people. 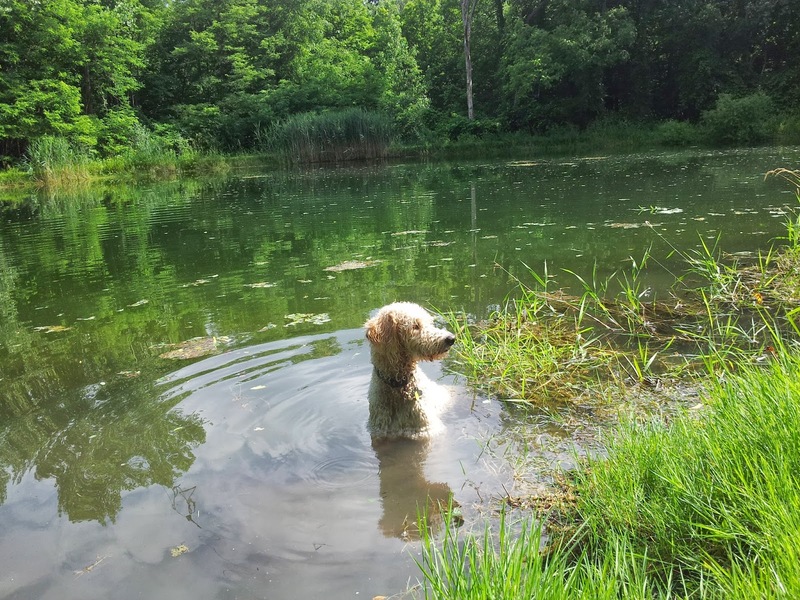 At the land, Milt had an absolute ball scampering down the trails, wading in the pond, scavenging in the underbrush, and he even barreled through the cornfield at one point -- a secret force rustling the ears as he scurried along! Mom and I were hard at work gathering loads of berries while the Milt frolicked. What do we do with our bounty? 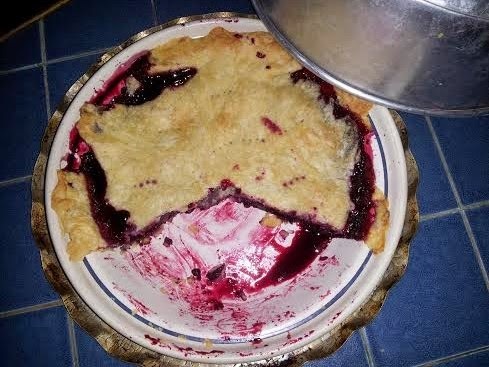 Well, we make muffins, of course, but, more importantly, we bake PIE! I decided yesterday that I am partial to blackberry picking rather than pecan gathering because once you pick the berries, you are done -- no shelling required! Dump a cup of sugar on the little black beauties, roll out a crust, and you have a refreshing summer treat! Baking a pecan pie, though, requires quite a few more ingredients, included the dreaded corn syrup, and a very steady hand to delicately float the pecans on top of the sickly sweet mixture. Most importantly, though, both desserts make superb homegrown gifts! I know you enjoyed the pie. Did Milton get any?